The Ultimate Guide to Organizing Your Kitchen! 1. Hang your trash bags on dowels under your sink, and your foil and parchment paper on dowels inside one of your cabinets for quick access. You’ll need curtain rod brackets for your trash bags ($7.76 for two on Amazon), and smallish Command Hooks for the foil ($6.36 for a pack of six hooks, also on Amazon). From Simply Organized and I Heart Organizing. 2. Mount pot lids on the inside of your cabinets and cabinet doors using two or three Command Hooks so they’re out of the way *and* you can grab the right one quickly. Get six medium Command Hooks (the ones pictured here) on Amazon for $6.38. 3. Then stack up your pans up on an organizer rack to take advantage of every inch of vertical space in your cabinets. Get it on Amazon for $16.87. 4. Transform the inside door of your baking cabinet into a measuring equivalents chart, and hang up your measuring cups and spoons so you can simply grab the one you need. Tidbits from the Tremaynes got their look with chalkboard paint and a marker, and Brittany Lauren (who submitted via Facebook) kept it simple and classy with the small wire Command Hooks. Get a pack of six wire hooks on Amazon for $6.36. 5. If you have a spare drawer, turn it into an easy-access spice rack with these customizable drawer organizers. You cut them to the length you need, and add as many to your drawer as will actually fit (the pack comes with six 18-inch strips). Get it on Amazon for $14.99. I have ZERO drawers in my tiny New York kitchen, so I feel this struggle. 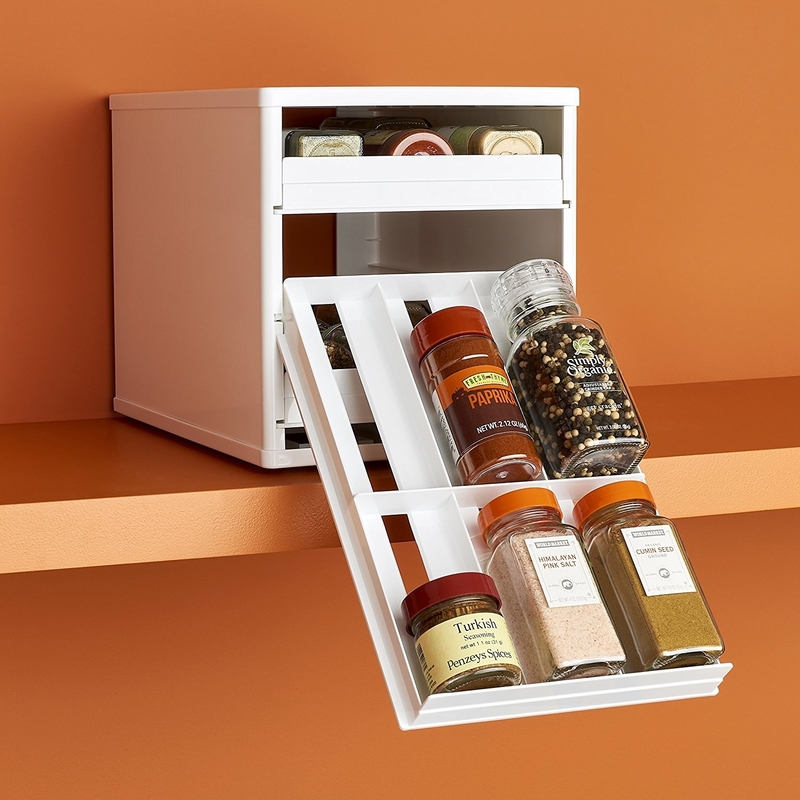 Get this spice organizer, which comes in 18-, 24-, and 30-bottle sizes, on Amazon for $34.99+. 7. …or that has magnets so your spices can hang on the side of your fridge, freeing up cabinet AND counter space. Get a pack of 12 magnetic spice tins on Amazon for $14.99. 8. Keep your knives from damaging the bottom of your drawer, slowly dulling themselves in the process, by protecting them with a knife block. It fits right in the drawer, and stores up to sixteen knives. Get it on Amazon for $19.95. 9. Or keep ’em out on the counter but still know which knife you’re about to pull with this transparent knife “block”. It’s easy to take apart and clean, too. You just insert your knives into thin plastic slots at the top, and the handle prevents them from falling in. Get it on Amazon for $29.95+ (available in round and rectangular). 10. 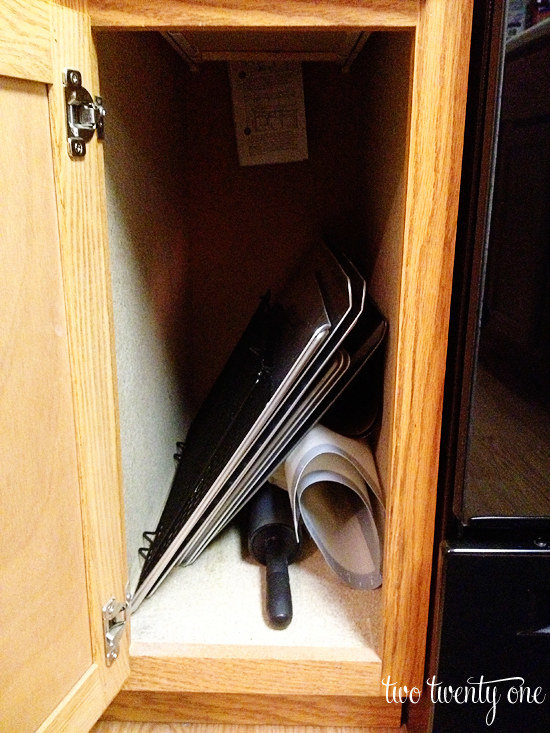 Repurpose an old paper file organizer from the office supply store to sort out your baking sheets and cooling racks. From Two Twenty One. Want to try this but don’t have one to repurpose? Get a similar rack for $11.59 on Amazon. 11. And for bigger or heavier-duty pans where the thin wire doesn’t quite cut it, try a rack made especially to sort cutting boards, muffin pans, and casserole pans. Get it on Amazon for $12.97. 12. For your tallest, bulkiest items, small tension rods can turn any two shelves into a sturdy storage spot. Just make sure to measure the height of your shelves! From Martha Stewart. Get a set of five tension rods that expand from about 12 inches to 20 inches on Amazon for $11.39(three colors). 13. 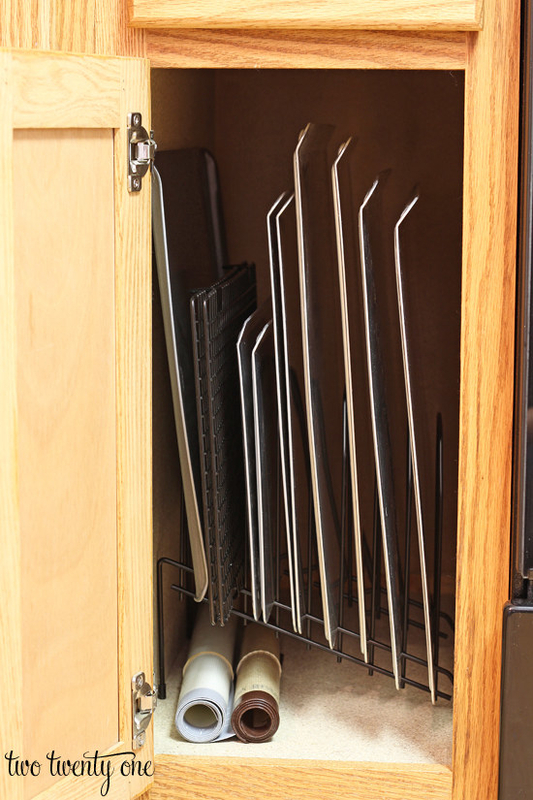 Or use a severaltension rods to divvy up the space above your fridge into the ultimate baking cabinet. 14. Put a Lazy Susan anywhere you need to corral a bunch of bottles, so you can quickly reach the ones in the back without pulling everything down. It’s especially helpful on higher shelves. From Making Home Base. Get a 12-inch Lazy Susan on Amazon for $7.99+ (also available in nine and 18 inches). 15. 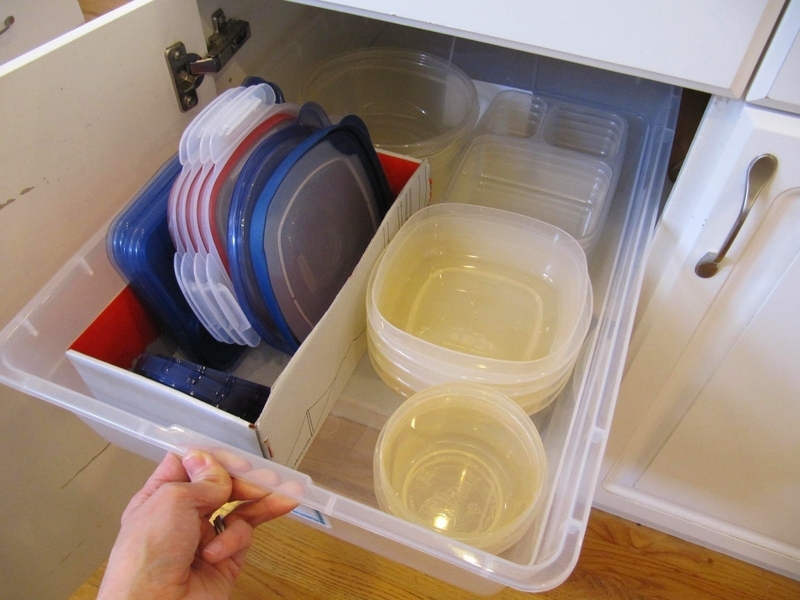 Tame your cluttered plastic ware by storing it in a drawer — you’ll use every inch of cabinet depth, but still be able to pull it forward to reach what you need. From Polished Habitat. Get a similar (six quart) drawer on Amazon for $13.49. 16. 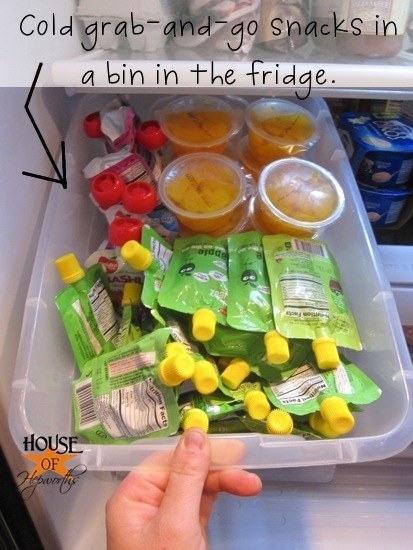 Or just sort it all into a shallow plastic container you already have that can act like a drawer, and use a shoebox to separate and stack the lids. You can also take this opportunity to go through your whole collection and donate or recycle the pieces you don’t actually use, or that don’t have matching lids/containers anymore. From Everyday Organizing. 17. Keep your soap, sponge, brushes, and other favorite dish-washing supplies neatly stored on a suction-cup organizer that drains any excess water directly into your sink. 18. Designate an “eat me first” bin, and use it to keep anything that’s close to expiring, so when you need a snack, you know where to go, well, first. From the (now-defunct! sigh) blog Closette. 19. 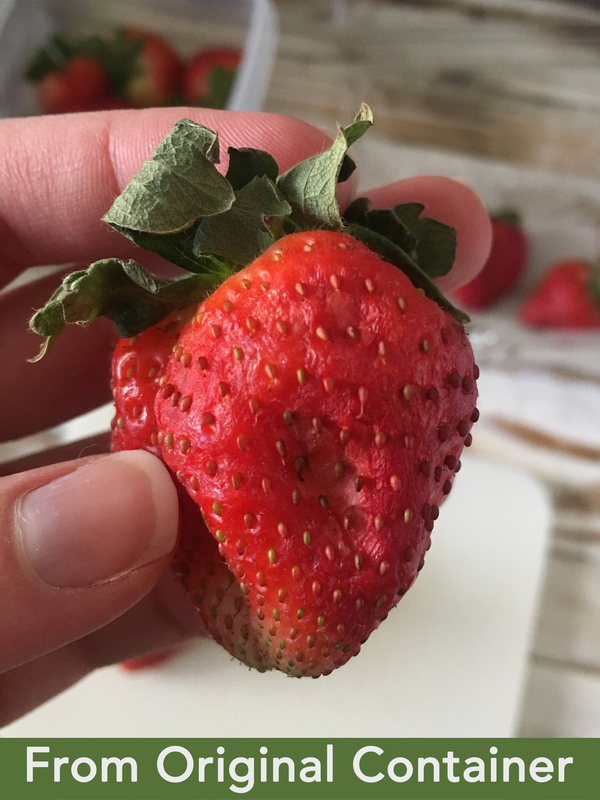 And, whether you have kids or just want to snack a little healthier yourself, keep pre-portioned snacks in another easy-access bin. From House of Hepworths and Organize Yourself Skinny. 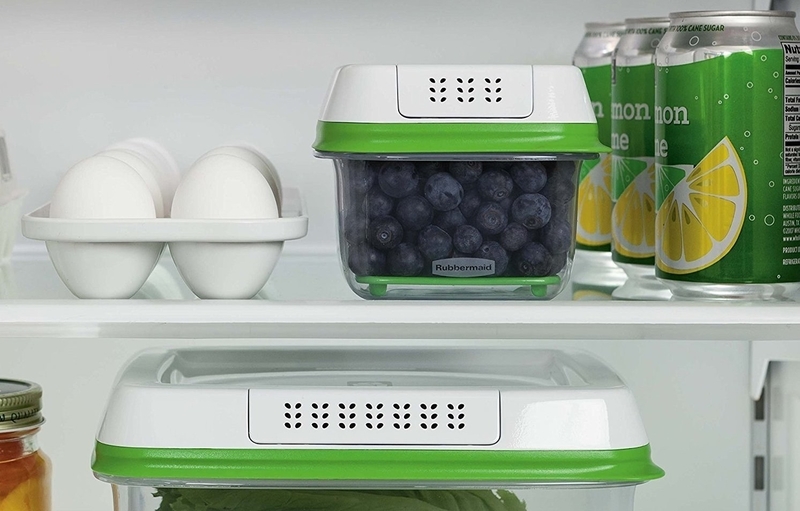 Get similar clear bins on Amazon for $12.72 (small, medium, and large sizes available). 20. Pick up a Lazy Susan or two for your fridge, too, so you never lose your favorite jar of olives to the back corner again. From Listotic. Get a 12-inch Lazy Susan on Amazon for $7.99+ (also available in nine and 18 inches). 21. If you have wire shelves, a binder clip can help store a stack of beers so it doesn’t roll away. From Flickr user Mathew Petty. 22. Turn one corner of your fridge into a mini wine chiller with this sturdy, stackable plastic rack. That way you can always have a chilled bottle of champagne ready for any little celebration! Get the pack of two on Amazon for $14.99. 23. Use expandable drawer organizers in your produce drawer so you can kiss your days of digging for the parsley goodbye. From Enjoy This Beautiful Day. Get a set of two drawer dividers on Amazon for $14.99. 24. 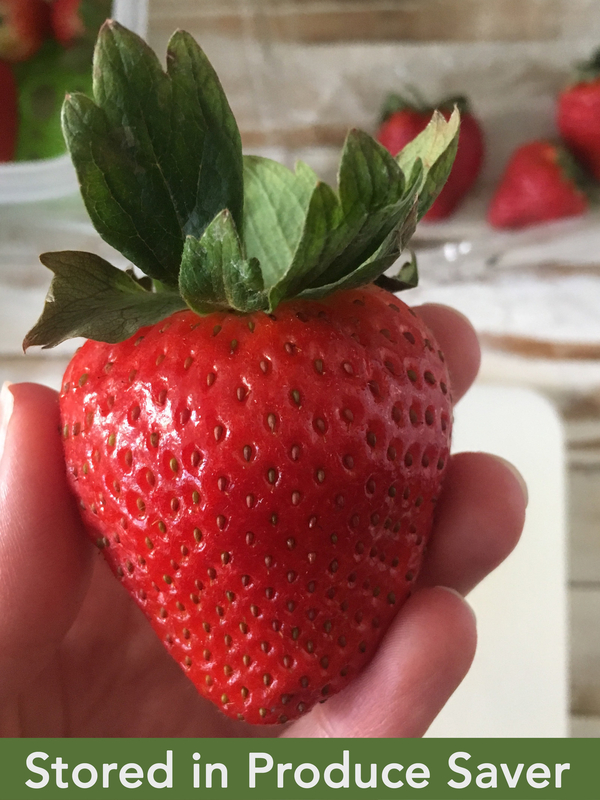 Store your fruits and vegetables that you’re worried might start go bad in produce savers that keep everything fresh for almost two weeks. I use and love these! Check out my full review, or get them on Amazon for $6.29+. 25. 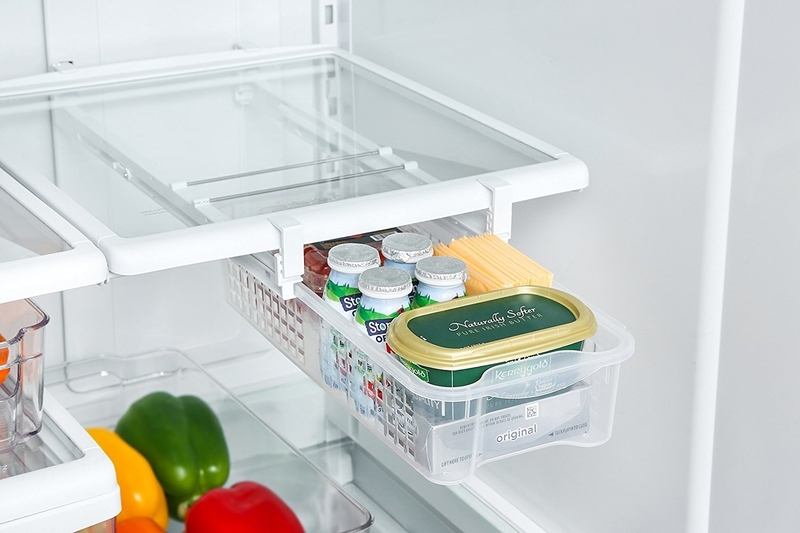 Add an extra drawer to take advantage of any extra space between your fridge shelves. Get it on Amazon for $18.99 (two sizes available). 26. 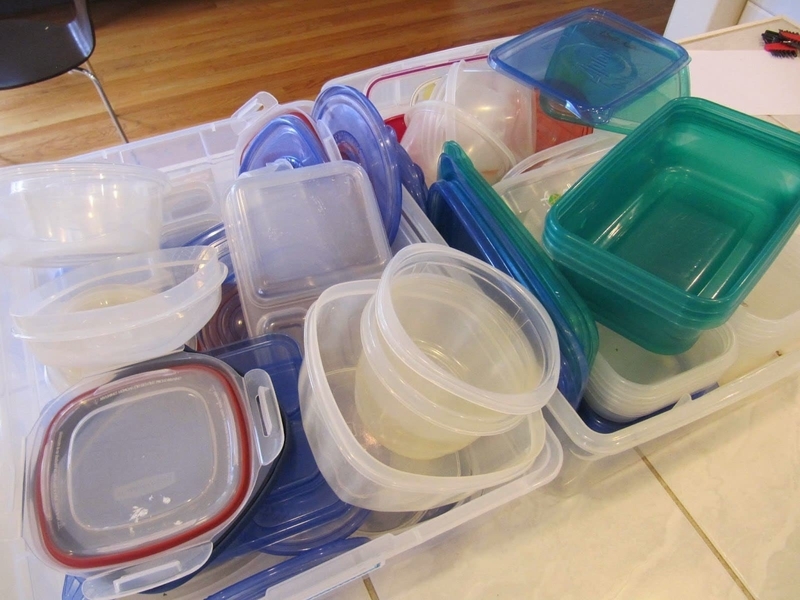 Consider keeping a separate plastic bin just for uncooked meat and fish. That way, if any of it leaks, the germy juices won’t end up on your produce. 27. Stack two magazine files on top of each other to actually find that bag of frozen corn without digging through a whole pile of other bags. 28. Hang an over-door shoe organizer to make an easy-access spot for all the small things that tend to get lost in the back of your pantry. From Real Mom Kitchen. Get one with 24 pockets on Amazon for $8.47. 29. Wire drawers and sliding trays are key if you want to maximize your access to every last inch of a deep shelf. The tray doesn’t need anything special installed, it just slides easily in and out. From Graceful Order; this is her pantry cabinet (not a walk-in). Get a similar drawer on Amazon for $20.98. 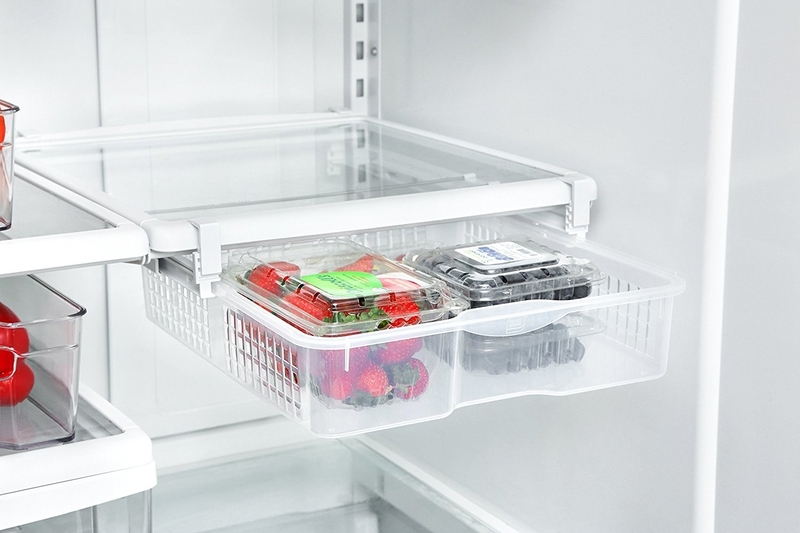 The exact tray she uses isn’t online, but two shallow plastic fridge organizers side-by-side would work similarly; get a pack of two on Amazon for $14.99. 30. 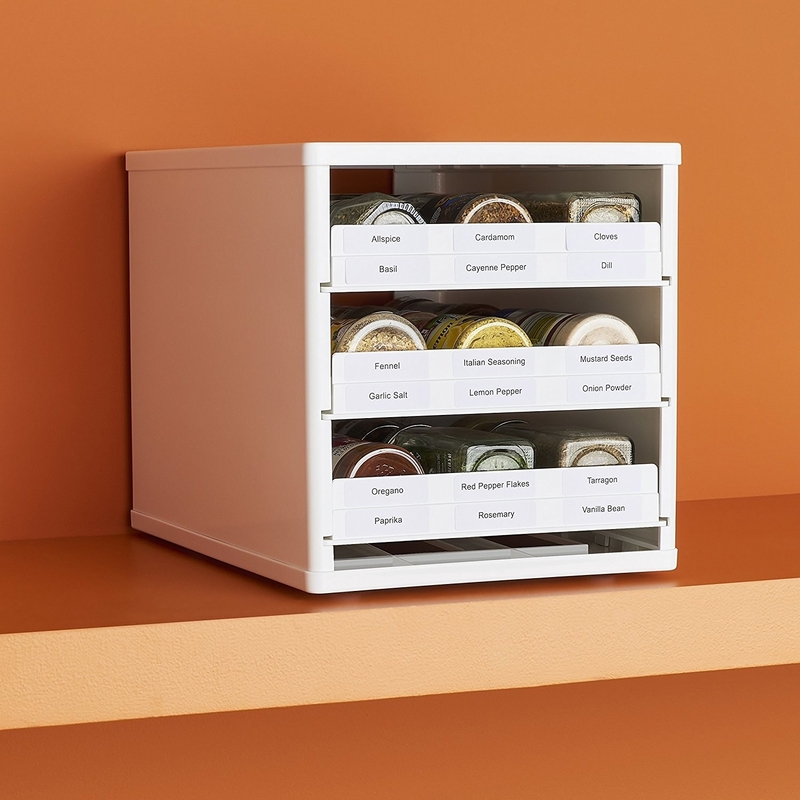 And yes, those Lazy Susans are back again to help you make the most of your shelf corners: they give you instant access to all the sauces, dressings, and whatever else you want to store back there. From Classy Clutter. Get a 12-inch Lazy Susan on Amazon for $7.99+ (also available in nine and 18 inches). 31. Keep track of all your seasoning packets by hanging them from a humble binder clip and one of those small wire Command Hooks. From the always-genius One Good Thing by Jillee. 32. File away your potatoes so they take up hardly any space but it’s still quick to pull out the file and see what you actually need. Jus *don’t* store your onions and potatoes right next to each other — onions go out on the countertop. If you store ’em together, both your potatoes and onions will spoil faster. From Mimi’s Crafty World. Get similar organizers on Amazon: $16.25 for a set of two nesting mesh organizers, or $11.96 each for a single mesh organizer. 33. Make all your flour, sugar, pasta, and grains easy to find and classy AF by storing them in a set of four airtight canisters. Get the set on Amazon for $16.88. Unfortunately they don’t come with those pretty chalkboard labels, but you can get a set of 40 (yes, FORTY) similar ones — that also happen to be waterproof — for $8.65, also on Amazon. 34. If you want to sort basically everything into labeled bins, opt for transparent bins that actually let you see what’s inside. Labels are great, but if your bins aren’t transparent, you might just find yourself forever reading label after label to ever find anything. This way, the bins and the labels can ~work together~. From Stacy Graves Interiors. Get the bins she used for $3.99+ at The Container Store (small, medium, and large sizes available). Or get a pack of four similar bins on Amazon for $49.99. 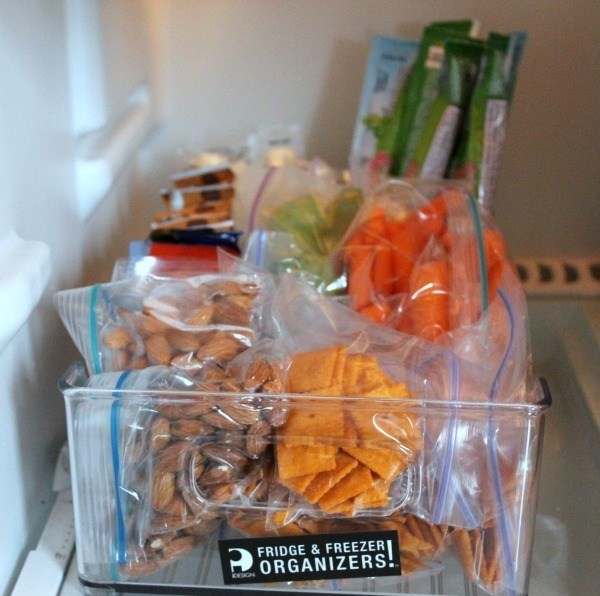 Want to do even more organizing? Check out our guide on cleaning every inch of your home, from bedrooms to bathrooms and more. How to Make a New House Your Own!